Improve and monitor your website's search engine rankings with our supercharged SEO tools. Instantly create competitor analysis, white-label reports and analyze your SEO issues. The meta title of your page has a length of 50 characters. Most search engines will truncate meta titles to 70 characters. The meta description of your page has a length of 177 characters. Most search engines will truncate meta descriptions to 160 characters. Start Nu met Fitness en Personal Training en schrijf je in voor een Gratis Kennismakingsles Fitness. Optimal Strength is dé plek voor Personal Training en Ftness in Assen e.o. There is likely no optimal keyword density (search engine algorithms have evolved beyond keyword density metrics as a significant ranking factor). It can be useful, however, to note which keywords appear most often on your page and if they reflect the intended topic of your page. More importantly, the keywords on your page should appear within natural sounding and grammatically correct copy. Congratulations! You are using your keywords in your meta-tags, which help search engines to properly identify the topic of your page. Find the keywords where this URL is listed in the top 20 results of Google's organic listings. Get useful insights and detailed metrics for your most important keywords: average position, search volume, CPC, and more. Register for free and start using today the Keyword Position Tracker tool from SEO Site Checkup Toolbox. Side-by-side SEO comparisons of up to 5 competitors. See how your SEO can improve against the competition. Congratulations! Your webpage contains headings tags. 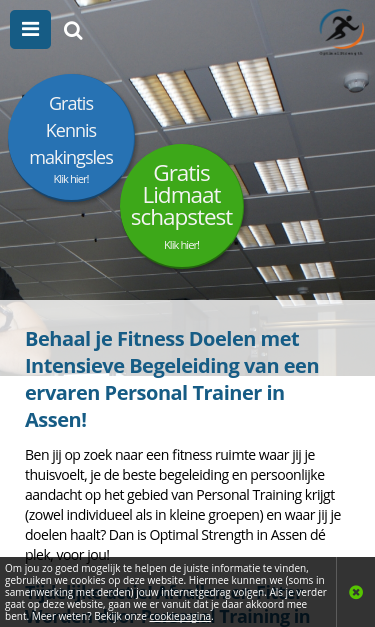 Behaal je Fitness Doelen met Intensieve Begeleiding van een ervaren Personal Trainer in Assen! Congratulations! Your website has a sitemap file. Looking for a Sitemap Generator Tool? If you don't have a sitemap or the sitemap for your website is not up to date you can use our new Sitemap Generator tool. Register for free, and start using today the Sitemap Generator from SEO Site Checkup Toolbox. Check your webpage for broken links! Finding and fixing broken links on your webpage will help both user experience and search engine rankings. Register for free, and start using today the Broken Links Tool from SEO Site Checkup Toolbox. Congratulations! All links from your webpage are SEO friendly. Your webpage is using "img" tags with empty or missing "alt" attribute. In order to pass this test you must add an alt attribute to every <img> tag used into your webpage. Remember that the point of alt text is to provide the same functional information that a visual user would see. Search engines, users who disabled images in their browsers and other agents who are unable to see the images on your webpage can read the alt attributes assigned to the image since they cannot view it. Learn more about optimizing images for SEO. Your webpage is using inline CSS styles! It is a good practice to move all the inline CSS rules into an external file in order to make your page "lighter" in weight and decrease the code to text ratio. Congratulations! Your page does not use HTML deprecated tags. Congratulations! Your webpage is using Google Analytics. Your site either doesn't have a favicon or this has not been referenced correctly. In the example above the "url_to_my_favicon" refers to the actual location of your favicon file. Get a full and detailed list of your backlinks! To view your total number of backlinks and referring domains, please sign-up for a free trial! Get everything SEO Site Checkup already has, plus more powerful tools and faster execution. Try the new features of our supercharged SEO ToolBox using a 14 day free trial account. Congratulations! The size of your webpage's HTML is 6.15 Kb and is under the average webpage's HTML size of 33 Kb. Faster loading websites result in a better user experience, higher conversion rates, and generally better search engine rankings. Congratulations! Your webpage is successfully compressed using gzip compression on your code. Your HTML is compressed from 27.6 Kb to 6.15 Kb (78% size savings). This helps ensure a faster loading webpage and improved user experience. Your website loading time is around 5.98 seconds and is over the average loading speed which is 5 seconds. Get detailed and accurate loading speed reports for your websites and see how your pages are being loaded over time. Register for free and use the Loading Speed Monitor from SEO Site Checkup Toolbox today and get valuable insights on how much time your customers need to wait until they see your page. Your page has more than 20 http requests, which can slow down page loading. You can try reducing http requests through various methods such as using text instead of images, using css sprites, using data URIs instead of images, or combining several external files together into one. Congratulations, you have a caching mechanism on your website. Caching helps speed page loading times as well as reduces server load. Congratulations! Your website does not include flash objects (an outdated technology that was sometimes used to deliver rich multimedia content). Flash content does not work well on mobile devices, and is difficult for crawlers to interpret. Congratulations! Your website is using cache headers for your images and the browsers will display these images from the cache. Congratulations! Your website is using cache headers for all CSS resources. Congratulations! Your webpage's CSS resources are minified. Congratulations, your page does not use nested tables. This speeds up page loading time and optimizes the user experience. Congratulations! Your webpage does not use frames. Congratulations! Your URL doesn't have any redirects (which could potentially cause site indexation issues and site loading delays). https://www.optimalstrength.nl and https://optimalstrength.nl resolve to the same URL. Your website is successfully using HTTPS, a secure communication protocol over the Internet. This site is not currently listed as suspicious (no malware or phishing activity found). Your server signature is on. Turning off your server signature is generally a good idea from a security standpoint. Read more on how to turn off server signature and improve your website's security. By default, the Apache webserver sends HTTP headers with some information about your server version, operating system, modules installed, etc. These informations can be used by hackers in order to exploit vulnerabilities (specially if you are running an older version). These information can be hidden or changed with very basic configurations. If you don't find it, just add these two lines at the end of the file. Note that, after you modify the configuration file, you must restart the Apache server. Congratulations! Your server has disabled directory browsing. We've found 1 email addresses in your page code. We advise you to protect email links in a way that hides them from the spam harvesters. In order to pass this test you must make your email addresses invisible to email spiders. Note that the best option is to replace your entire contact mechanism with a contact form and using the POST method while submitting the form. Congratulations, your website uses media query technique, which is the base for responsive design functionalities. You can see below how your website looks on the portrait view of a mobile device. Congratulations! Your website is using HTML Microdata specifications in order to markup structured data. Your webpage does not use the noindex meta tag. This means that your webpage will be read and indexed by search engines. Your webpage does not use the canonical link tag. Your webpage does not use the nofollow meta tag. This means that search engines will crawl all links from your webpage. Your robots.txt file disallow the search engines access to some parts of your website. You are advised to check carefully if the access to these resources or pages must be blocked. Congratulations! Your DNS server is using an SPF record. Your webpage's meta title is an HTML tag that defines the title of your page. This tag displays your page title in search engine results, at the top of a user's browser, and also when your page is bookmarked in a list of favorites. A concise, descriptive title tag that accurately reflects your page's topic is important for ranking well in search engines. Your webpage's meta description is an HTML tag that is intended to provide a short and accurate summary of your page. Search engines use meta descriptions to help identify the a page's topic - they may also use meta descriptions by displaying them directly in search engine results. Accurate and inviting meta descriptions can help boost both your search engine rankings and a user's likelihood of clicking through to your page. Check how your page might appear in Google search results. Google search results typically uses your webpage title, url and meta-description in order to display relevant summarized information about your site. If these elements are too long, Google will truncate their content. Webpage title up to 70 characters in length, and webpage descriptions up to 160 characters in length are recommended in order to optimize readability. Check the most common keywords in your page and their usage (number of times used). This can help give a quick overview of the keywords and topics that crawlers may associate with your web page. The Keyword Cloud is a visual representation of keywords used on your website. This will show you which words are frequently used in the content of your webpage. Keywords having higher density are presented in larger fonts and displayed in alphabetic order. Check if your webpage is using any H1 and H2 HTML header tags. Header tags are not visible to users, but help clarify and support the overall theme or purpose of your page to search engines. The H1 tag represents the most important heading, e.g., the title of the page or blog post. The H2 tag represents the second most important headings on the webpages, e.g., the subheadings. Waarom kiest Assen voor Optimal Strength? Check if your website is using a robots.txt file. When search engine robots crawl a website, they typically first access a site's robots.txt file. Robots.txt tells Googlebot and other crawlers what is and is not allowed to be crawled on your site. Check if the website has a sitemap. A sitemap is important as it lists all the web pages of the site and let search engine crawlers to crawl the website more intelligently. A sitemap also provides valuable metadata for each webpage. Check if your webpage URLs are SEO friendly. In order for links to be SEO friendly, they should contain keywords relevant to the page's topic, and contain no spaces, underscores or other characters. You should avoid the use of parameters when possible, as they make URLs less inviting for users to click or share. Google's suggestions for URL structure specify using hyphens or dashes (-) rather than underscores (_). Unlike underscores, Google treats hyphens as separators between words in a URL. Check if images on your webpage are using alt attributes. If an image cannot be displayed (e.g., due to broken image source, slow internet connection, etc), the alt attribute provides alternative information. Using relevant keywords and text in the alt attribute can help both users and search engines better interpret the subject of an image. Check your webpage HTML tags for inline CSS properties. Inline CSS property are added by using the style attribute within specific HTML tags. Inline CSS properties unnecessarily increase page size, and can be moved to an external CSS stylesheet. Removing inline CSS properties can improve page loading time and make site maintenance easier. Check if your webpage is using old, deprecated HTML tags. These tags will eventually lose browser support and your web pages may render incorrectly as browsers drop support for these tags. Check if your website is connected with Google Analytics. Google Analytics is a popular, free website analysis tool that helps provide insights about your site's traffic and demographics. Check if your site is using and correctly implementing a favicon. Favicons are small icons that appear in your browser's URL navigation bar. They are also saved next to your URL's title when your page is bookmarked. This helps brand your site and make it easy for users to navigate to your site among a list of bookmarks. Check if your page is connected to one or more of the popular social networks. Social signals are become increasingly important as ranking factors for search engines to validate a site's trustworthiness and authority. Check if your website is using HTML compression. HTML compression plays an important role in improving website speed by finding similar strings within a text file and replacing them temporarily to reduce overall file size. Check your website's loading speed. Page speed is an important factors in search engine rankings and overall site success. Pages that take longer than 5 seconds to load can lose up to 50% of users. Faster webpages result in higher traffic, better conversions and increased sales over slower loading pages. Check if all the objects requested by this webpage can be retrieved. If they are not retrievable, your page may display incorrectly, leading to a bad user experience and lower search engine rankings. Check if your page is serving cached pages. A page cache saves dynamically generated pages and serves the pre-generated (cached) page to reduce server load and site loading time (by avoiding the re-loading and execution of PHP scripts). Common caching methods are ZenCache and WP Rocket. Check if your page uses Flash, an outdated technology that was typically used to deliver rich multimedia content. The web has evolved to replace Flash with open-standard technologies that additionally offered better performance and security. Flash content also does not work well on mobile devices, and is difficult to index by search engines. Checks if your page is using an image expires tag, which specifies a future expiration date for your images. Users browsers will see this tag and cache the image in their browser until the specified date (so that it does not keep re-fetching the unchanged image from your server). This speeds up your site the next time returning visitors arrive at your site and require the same image. Checks if your page is using caching headers for all CSS resources. Users browsers will check for these headers and, if any, will cache the CSS resources until the specified date (so that it does not keep re-fetching the unchanged file from your server). This speeds up your site the next time returning visitors arrive at your site and require the same CSS resource. Checks if any CSS files used in your page is minified. Minified files reduce page size and overall load time. Check if this site contains nested tables. A nested table is an HTML table containing another table inside it. Use of nested tables can slow down page rendering in the user's browser. Check if your page is using frames, which divide your browser window into multiple sections where each section can load separate HTML documents. Frames create problems for both users (e.g., by creating unexepected behavior with printing functions or use of the back-button) and search engine robots (by complicating the crawling process). Avoid use of frames when possible. Check for doctype declaration. A document type declaration, or DOCTYPE, defines which version of (X)HTML your webpage is using. Proper doctype declaration assists with proper page rendering and functioning of web documents in compliant browsers. Check how many redirects your URL will perform to resolve to the final destination URL. Redirects often cause search engine indexing issues and can also lead to some minor loading delays. Google recommends removing or keeping redirects to a minimum. Test your site for potential URL canonicalization issues. Canonicalization describes how a site can use slightly different URLs for the same page (e.g., if http://www.example.com and http://example.com displays the same page but do not resolve to the same URL). If this happens, search engines may be unsure about which URL is the correct one to index. Learn more about canonicalization issues. Check if your website is using HTTPS, a secure protocol for sending/receiving data over the Internet. Using HTTPS indicates that an additional encryption/authentication layer was added between client and server. HTTPS should be used by any site that collects sensitive customer data such as credit card information. Even for sites that do not collect such data, switching to https helps users by improving privacy and overall security. Google is increasingly using https as a positive ranking factor. Check if your website is identified as having malware or exhibiting phishing activity by Google's safe browsing API. Any site containing malware or suspicious for phising activity is seen as a threat to the online community and is often penalized by search engines. This test checks your website against regularly updated malware and phishing databases of problem websites. Check if your server's signature is ON. A server signature is the public identity of your web server and contains sensitive information that could be used to exploit any known vulnerability. Turning your server signature OFF is considered a good security practice to avoid disclosure of what software versions you are running. Check if your server allows directory browsing. If directory browsing is disabled, visitors will not be able to browse your directory by accessing the directory directly (if there is no index.html file). This will protect your files from being exposed to the public. Apache web server allows directory browsing by default. Disabling directory browsing is generally a good idea from a security standpoint. Check your webpage for plaintext email addresses. Any e-mail address posted in public is likely to be automatically collected by computer software used by bulk emailers (a process known as e-mail address harvesting). A spam harvester can read through the pages in your site and extract plaintext email addresses which are then added to bulk marketing databases (resulting in more inbox spam). There are several methods for email obfuscation. Check if your page implements responsive design functionalities using the media query technique. The '@media' rule allows different style rules for screen sizes. Media query techniques allow different presentation and content to be served depending on the output device, helping ensure that your website renders optimally on all devices and platforms. Check how your website renders on a mobile device. Check if your website uses HTML Microdata specifications (or structured data markup). Search engines use microdata to better understand the content of your site and create rich snippets in search results (which helps increase click-through rate to your site). Check if your webpage is using the robots meta tag or the X-Robots-Tag HTTP header to instruct search engines not to show your site in search results pages. Check if your webpage is using the canonical link tag. The canonical link tag is used to nominate a primary page when you have several pages with duplicate or very similar content. Check if your webpage is using the robots meta tag or the X-Robots-Tag HTTP header to instruct search engines not to follow the links on your page. Outgoing links marked with this tag will tell search engines not to follow or crawl that particular link. Google recommends that nofollow tags are used for paid advertisements on your site and links to pages that have not been vetted as trusted sites (e.g., links posted by users of your site). Check if your robots.txt file is instructing search engine crawlers to avoid parts of your website. The disallow directive is used in robots.txt to tell search engines not to crawl and index a file, page, or directory. Check if your DNS records contains an SPF record. SPF (Sender Policy Framework) records allow email systems to verify if a given mail server has been authorized to send mail on behalf of your domain. Creating an SPF record increases email delivery rates by reducing the likelihood of your email being marked as spam. Analyze and monitor your SEO with our powerful ToolBox.